Bay windows are fairly rare in New York apartment buildings, especially on Fifth Avenue and the best, at least in terms of breadth, are to be found in this 1958 building. Two very broad bays run the full height of the buildings avenue frontage with dark gray metal spandrels in stark contrast to the buildings white-brick facade. The aluminum mullions of the bays give this facade a strong vertical emphasis, although the overall effect is a bit awkward. The rather flat curves of the bays are modest and soft and not very dramatic, although they afford spectacular vistas from the interior. One wonders why their facade treatment was not applied to the entire building. The answer is probably that the resulting design would have been considered too modern an intrusion on the avenue at the time. If it had the effect might have appeared as a miniature Union Carbide tower with ripples. (The former Union Carbide Building, erected around the same time, was designed by Skidmore, Owings & Merrill and is on Park Avenue at 47th Street.) The dark gray spandrels beneath the bay windows are a little drab and hopefully might be replaced by new panels, perhaps darker and polished, at some future date. 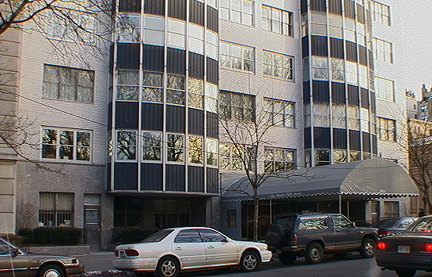 The buildings facade on 71st Street is asymmetric, reflecting the interior layouts with large picture windows at the east and smaller windows near the avenue. The building has a few terraces, some of which are curved, and a very large enclosed watertank. The views on the sidestreet are superb since the building is across the street from the low-rise building of The Frick Collection that occupies the entire blockfront on the avenue between 71st and 70th Streets. The 20-story cooperative building, which was designed by Sylvan and Robert Bien, has 50 units and central air-conditioning. Most apartments range in size from six to nine rooms. The sidestreet contains many major mansions although this building replaced the 1926 townhouse of Mrs. Hamilton McK. 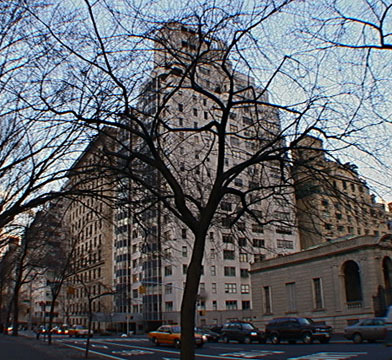 Twombly that had been designed by Warren & Wetmore and another designed by Horace Trumbauer on Fifth Avenue for Mrs. Elinor Widener. 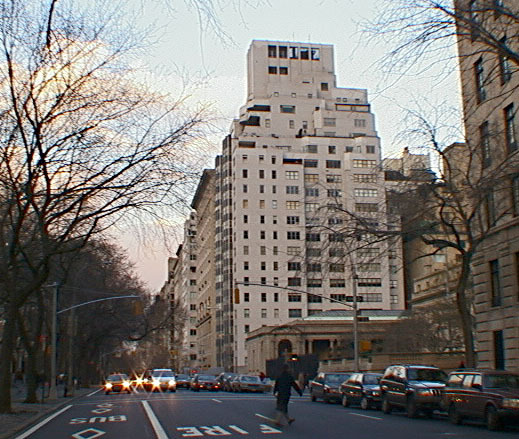 The character of the sidestreet had been altered by the demolition of the H. A. C. Taylor home designed by McKim, Mead & White for the 1946 apartment building designed by Emery Roth & Sons at 3 East 71st Street. 900 Fifth Avenues location is supreme as it is wedged between the glorious Frick Collection to the south and J. E. R. Carpenters fine Italian-Renaissance-palazzo-style apartment building of 1916 at 907 Fifth Avenue just to the north. One block south of a major entrance to Central Park and cross-town bus service on 72nd Street, the building is in a quiet location yet close to many of the famous boutiques of Madison Avenue. 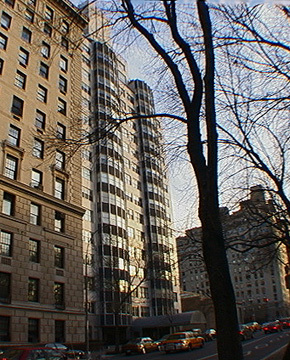 The building has a one-story polished gray granite base, a large canopy, a doorman, a concierge and sidewalk landscaping. It also has a gym and a garage and in 2008 it replaced its white-brick facade. It is not close to subways but there is excellent bus service.